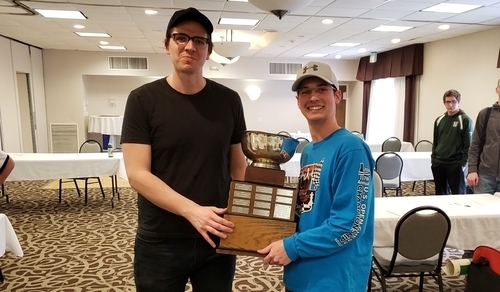 Wyatt Hendrix of Hermon and Lucas McCain of Yarmouth won the 2019 Maine State Chess Championship held at the Waterville Grand Hotel on April 13-14th. Both players put up 4.0 points--Hendrix an undefeated three wins and two draws, and McCain four wins and one loss. Congratulations to our newly minted State Champions! 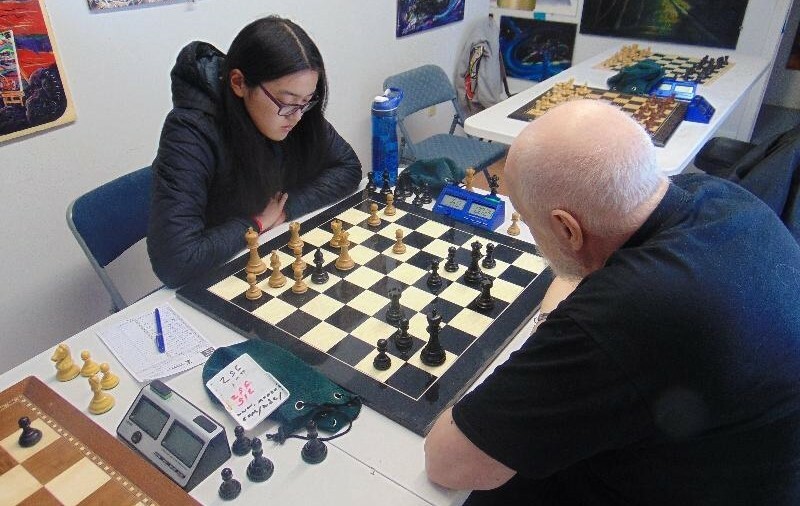 Cynthia Cui of New Brunswick, Canada took clear first at the seven-player Houlton Spring Open played on Saturday, April 6th at the Art Studio in Houlton, Maine. Roger Morin came second and Tristan Cousineau took clear third. Here's the illustrated tournament report with US Chess crosstables. Maine Chess Association Secretary Wyatt Hendrix has established the First Online Maine Open, a three-day-per-move round robin, in which players will be grouped by fives and will play four games simultaneously correspondence style. 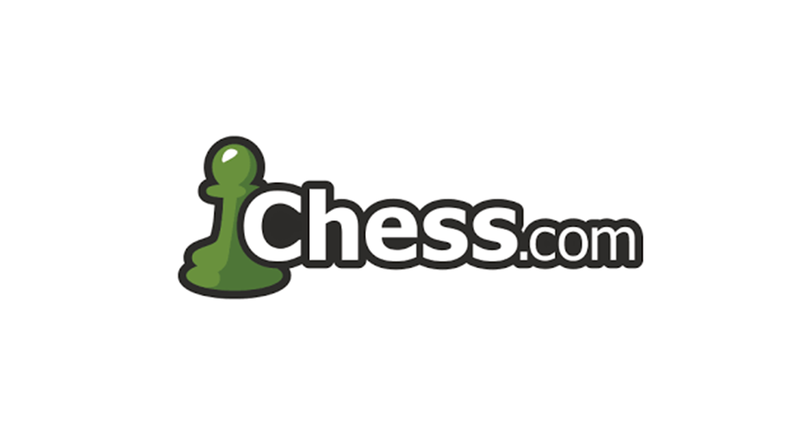 The tournament will be hosted on Chess.com and is scheduled to begin on Wednesday, April 10th. The U.S. 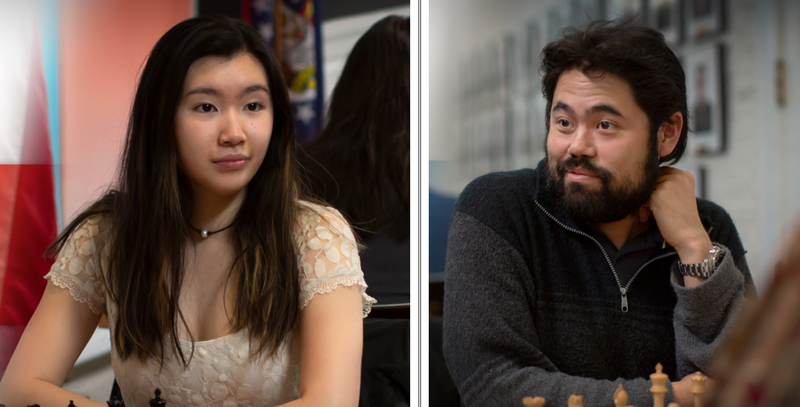 Chess Championship went down to the wire this afternoon in St. Louis where, in the final round, the three top players---Nakamura, Caruana, and Dominguez--had 7.0 points. Caruara was first to draw. When Nakamura pulled off a win with Black vs Xiong, all eyes were on Dominguez-Gareyev. The native Cuban, now playing for the U.S., had an extra knight but with only two rook-pawns on the board he could not convert the win. With that, Hikaru Nakamura became the 2019 U.S. Champion. Seventeen-year-old Jennifer Yu had already wrapped up the U.S. Women's Championship title with a round to spare but for good measure won her last game vs Carissa Yip for an incredible 10 points in eleven games. One hundred sixty-eight scholastic chess players competed in the largest State Scholastic Individual Chess Championships in Maine history. The tournament, which attracted players from accross the state, offered six sections of competition: K-1, K-3, K-6, K-8, K-12 U1200, and K-12 Championship. In addition, a twelve-player open event was held concurrently. Here's the illustrated tournament report with complete results and US Chess crosstables. 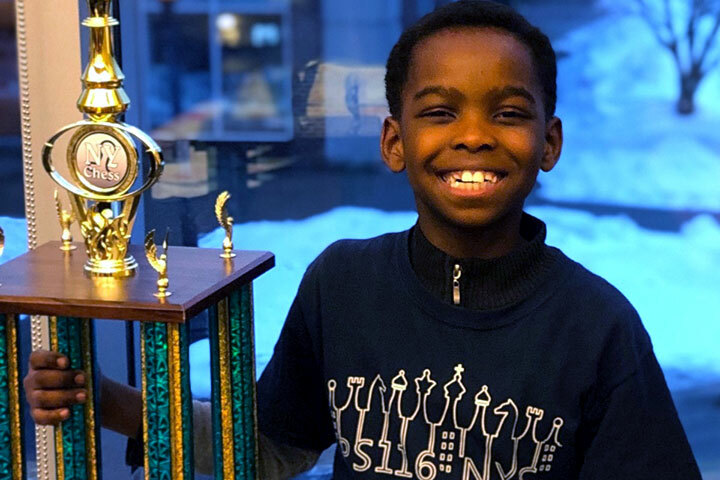 You may have heard about eight-year-old Tanitoluwa (Tani) Adewumi who, just one week ago, was living with his family in a homeless shelter in New York City. 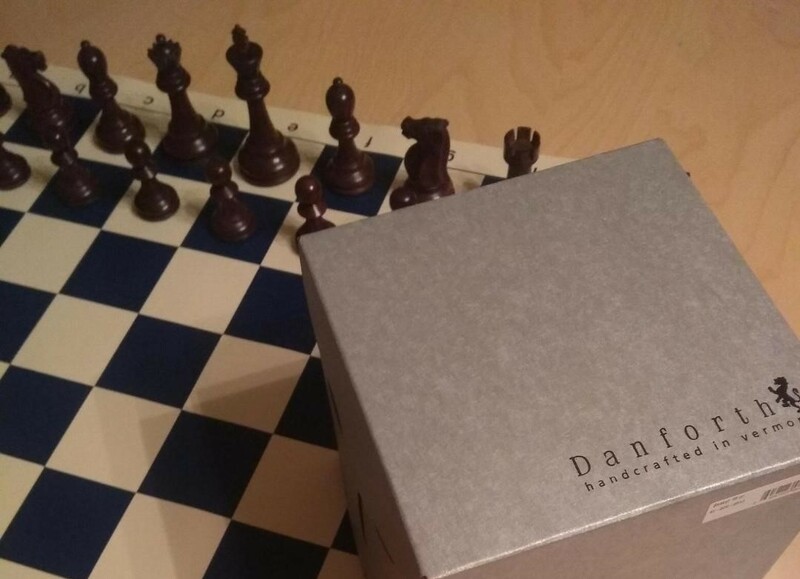 Because of his outstanding performance at the New York Scholastic Chess Championship and the subsequent media attention he is receiving, a generous donor has come forward to offer his family a rent-free apartment, and a GoFundMe campaign has raised nearly $250,000 which his family will use to help other African immigrants through the new Tanitoluwa Adewumi Foundation. Sixty-four players came out to compete in the Claude E. Webber Memorial Tournament played at Bonny Eagle Middle School in Buxton on Saturday, March 23rd. Players hailed from: John Bapst, Cheverus, Westbrook, Thornton Academy, Cape Elizabeth, Bonny Eagle, Buxton Center, Windham, Gorham, George E Jack, and Falmouth. Here's the illustrated tournament report and wrap-up courtesy of tournament organizer Oisin O'Searcoid. With one event remaining in the 2019 Crusader Cup Series--the 2019 John Bapst Open to be played on May 11th--we bring you the current top twenty players in this year-long, four-tournament competition. 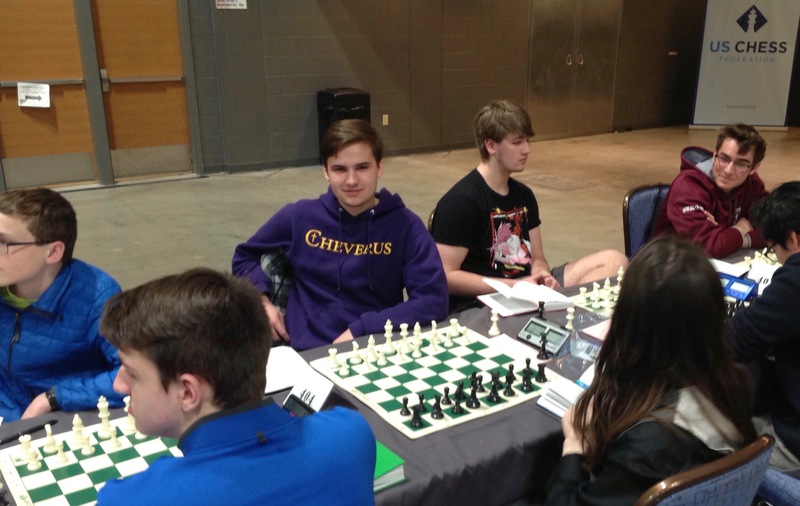 Five players from Cheverus High School in Portland along with their coach Dan Lavallee made the trip to Chicago to compete in the 2019 National High School (K-12) Championship. Sam Holbrook scored an incredible undefeated 6.5 points in seven games to finish equal second in the 392-player U1200 section. Here's the rundown of the event courtesy of coach Lavallee. 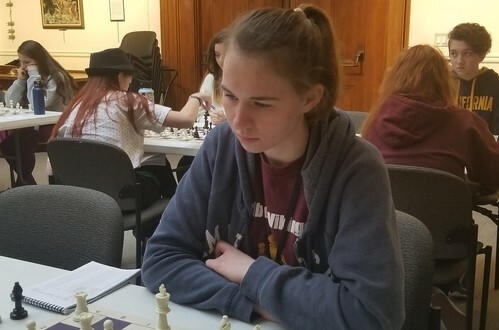 Caribou High School senior, Hailey Holmquist, will represent Maine at the Susan Polgar Foundation Girls' Invitational chess tournament from June 22-27 at Webster University in St. Louis, Missouri. 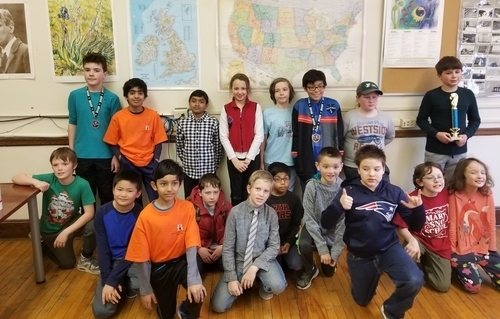 Holmquist earned her invitation to the prestigious tournament, which selects one female scholastic chess player from each state, as a result of her performance at the Maine Girls' Championship held at the Bangor Public Library in February. Congratulations to Hailey for receiving this honor and all the best in St. Louis!